When his experiment began, Aaron Bloomfield was designing and building molecules for their potential to capture, transfer and store renewable energy. “The experiment wasn’t working, so we started to explore the reasons why, and that lead us down a very interesting path,” explains Bloomfield, a post-doctoral chemist in Yale’s Energy Science Institute at West Campus. That’s when he found two cowboys, one of them behaving quite strangely. Working with mentors Robert Crabtree and Victor Batista, Bloomfield was following a supposedly straight forward process to compare two very similar molecules that differed by only one carbon atom. 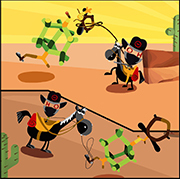 Bloomfield thinks of the two precursor molecules as cowboys – each with a pair of boots (a methyl ester) and a hat (an amide). According to common knowledge, it should be easy to remove the boots without disturbing the hat, but this was not what he found. “When we removed their boots, one of our cowboys was well behaved, no change there. But with the other his boots and hat fell clean off. No matter how we removed the boots, everything fell off our second cowboy,” explained Bloomfield, whose findings have been published in the New Journal of Chemistry. Despite extravagant lab techniques, he repeatedly found the badly behaved molecule would slump in on itself, with its ‘hat’ and ‘boots’ immediately jettisoned. Subjecting crystals of the two molecules to X-ray, Bloomfield continued to analyze them at an atomic scale. This revealed the root of the difference in the cowboys’ behaviors: the well-behaved cowboy wore his hat squarely on his head, while the misbehaved cowboy was wearing his hat on his shoulders. Through this apparently trivial change to his character, adding a single carbon atom had caused the molecule to change conformation, twisting the carbon-nitrogen bond that holds the hat on. This type of molecular contortion had been observed as far back as the 1960s, but with little explanation of why, and no consideration of the implications. It turns out that adding the methyl group instead of a hydrogen group changed the symmetry of the electron distribution in the molecule, effectively redefining the structure of the whole molecule. As the simplest of atoms, hydrogen can only support simple spherically symmetrical orbitals. If replaced with a more complex atom, molecules can support more exotically shaped orbitals, which allow this effect to manifest. The fact that the shape of the electron distribution changes so dramatically, and that it caused the change in the molecule’s shape, had not been previously recognized. To Bloomfield, the process provided a valuable reminder of how to react when a troublesome experiment had threatened to derail his work. Undeterred by an apparent dead end, his miscreant cowboy prompted a different question, and a change of course that is expected to have wide-reaching implications, not only for how scientists capture and store renewable energy, but also how they design new drugs, new adhesives, and new dyes. Bloomfield’s article is featured on the cover of the March, 2016 issue of New Journal of Chemistry.